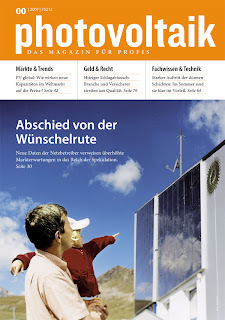 Solarpraxis AG (FRA:SPA) and Alfons W. Gentner Verlag GmbH & Co. KG have formed a joint venture and launched the unusual issue 00 (double zero) of Photovoltaik-Magazin für Profis at Intersolar 2007 with a 50,000 copy first run. Neue Fachzeitschrift „Photovoltaik“ geht mit 50.000 Auflage an den Start announced the partnership and goals for this new German language publication back in March 2007. Starting with the September 2007 issue, Photovoltaik will be published every month. I spoke at length with Karl-Heinz Remmers, Solarpraxis AG CEO, to obtain a better understanding of Photovoltaik’s positioning and innovative approach to serve solar electric professionals. Every new publication covering photovoltaics is faced with immediate questions. Are they a direct competitor to industry leader PHOTON? In this case, how are they positioned versus the German language version, PHOTON – das Solarstrom-Magazin? Since Photovoltaik targets active specialists and decision makers of the solar power industry, Photovoltaik is narrower in scope than PHOTON’s A to Z kitchen sink approach to the photovoltaic market for every demographic from consumers to University Professors. Photovoltaik is centered around two to four page analysis articles covering the prominent issues. Each article will include a one or two sentence executive summary for the ultimate time stressed, multitasking industry professional. While the 00 issue Editorial describes the style, format, and standard columns of the periodical, two innovative columns stand out. First, active trade electricians and photovoltaic professionals are polled each month to gauge the health and outlook for the market in Germany on a regional basis. Second, the Klagemauer (Western Wall) highlights the top challenges or complaints of professionals in the industry. In the first issue, the modules are too heavy was the number one complaint of installers. I think this will remain a top three gripe for a long time! Photovoltaik will also leverage the Internet to supplement articles, update content, and even offer an online version of the publication. Online subscriptions hosted by servers powered by renewable energy offer a sustainable alternative to print media. German photovoltaic industry professionals can sign up for a two month trial of Photovoltaik by going to http://www.photovoltaik.eu/de/abo/ and completing the online form. I hear the Solarpraxis Team will be attending (and exhibiting at?) Solar Power 2007 in Long Beach, California USA, and may have something to show. Perhaps a localized version of Photovoltaik for the US market is in the works? Solarpraxis and Gentner have international ambitions to expand their joint venture publications with local partners worldwide. I noticed the trial weblink changed so start from the home page, http://www.photovoltaik.eu/.